This school year was my son's last in Cub Scouts. Our pack generally only had one campout per year, and I was asked to prepare a devotional to share with the kids Sunday morning. Unfortunately, the campout had to be cancelled, so my devo never got used. This morning my boy is at his first campout as a Boy Scout, out at the Cub World facility where our pack would have been camping, so I thought it would be an appropriate time to share the devo I prepared many months ago but never got to use. Remember, this was intended for a verbal presentation to kindergarteners through fifth graders! If you need a devo for a Cub Scout outing and can use any part of this, feel free. (For the record, the version I would have shared with the Cub Scouts wouldn't have been quite this detailed... some of the boys are as young as 6 or 7 years old, after all)! I was thinking about my son Mikey. 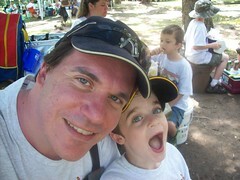 Mikey is ten now, but when he first joined Cub Scouts, he was 6 years old and he was a Tiger Cub. Who's a Tiger Cub today... anyone? (Wait for answers) Well, Mikey has been in Cub Scouts all that time. He's a Webelos 2, and later this year when he's too old for Cub Scouts, he's decided to move on into Boy Scouts. He was a little squirt back when he first started, but he's a lot bigger now! He's been doing a lot of growing up in Cub Scouts! That verse mentions four things about Jesus growing up. Jesus increased in wisdom. Jesus increased in stature - I'll explain what that is in a minute. Jesus increased in favor with God. Jesus increased in favor with man. Let's talk about "stature" first. Does anyone here have a doorway or a wall or a chart where you mark how tall you are over the years to see how much you've grown up? (Let a few kids speak up if they want.) You're growing bigger all the time! Are any of you parents growing bigger all the time? :) Everybody grows bigger... Jesus did too. That's increasing in "stature." Now let's talk about "wisdom" - that's harder to understand. What is "wisdom"? (Listen to a few answers if they have some.) Well, I'll tell you what I think about that in a minute, but first, let's see how you get wisdom. The Bible tells us that wisdom comes from God (Proverbs 2:6), and in another place it tells us that if we need wisdom we should ask God and He will give it to us (James 1:5). In another place (Proverbs 8:35), it says that you have to look for wisdom to find it. But if you look for it and find it, you will also find life and obtain God's favor. Hey, remember the verse about Jesus? And Jesus increased in wisdom and in stature and in favor with God and man! So there's a hint as to how to get favor with God. But we're getting ahead of ourselves a little bit now, because I told you I'd tell you what I think wisdom is. Did you know the Bible calls some people "stupid?" Isn't that funny? But you're not the Bible, so don't call people "stupid" 'cause it's not polite when a person does it. See, if you were thinking about calling somebody stupid, I've just given you some correction! So if you pay attention to that correction, you will have knowledge you didn't have before. When your mom or dad corrects you because you've done something wrong, if you receive their correction with your heart right, you will learn something important from it. Nobody likes to be corrected... I don't like to be called out when I do something wrong! But if you keep a humble heart, you learn something and you do better the next time. But that verse is talking about knowledge. Is knowledge the same as wisdom? No, it's not! Knowledge is part of wisdom, but it's not the same thing. Knowledge is knowing facts with your brain. Mikey has been working on his times tables; when you know that six times six is... (wait for them to say "36") ...that's knowledge. But wisdom... wisdom is knowing in your heart what the right thing to do is. When you have a tough decision to make, and you make the right choice, that's wisdom. Who's read Diary of a Wimpy Kid? (Wait for hands.) Well, in one place in that book, Greg Heffley gets his best friend in trouble. Anyone remember his friend's name? Yep, it's Rowley! Well, Greg gets Rowley in trouble, and nobody but Greg knew what had really happened. Greg thought and thought about it, and decided to "just let Rowley take one for the team this time around." That was NOT wisdom! Anyway, let's talk about "favor". When Jesus was growing up, He increased in favor with God, and in favor with man. "Favor" means that when people think of you, they think about how much they respect or admire or like you. Guess where the Bible tells us that favor comes from? Anybody have a guess? It comes from God, too! (Psalm 84:11) But there are some things you can do to get that favor, just like there are things you can do to get wisdom. But before I tell you what I've found out, let's say the Cub Scout Promise. One way you obtain the favor of God and man is by serving Christ Jesus. That sounds a lot like "doing my duty to God," doesn't it? Let me read you one more verse this morning - I'm almost done. So if you keep "love and faithfulness" with you, you will "find favor and good success" with God and man. When that verse says "love" it doesn't mean falling in love with a girl. Any Cub Scouts here in love with a girl? (Wait for the "ew" and "yuck" chorus to end.) Okay, well, that's not what it means. It basically means kindness. Showing love for someone by being a friend or a helper to them. To "help other people," just like in the Cub Scout Promise! And "faithfulness" means that you can be depended on; you're always where you're supposed to be, doing what you are supposed to be doing. Sounds just like "obeying the law of the pack," doesn't it? If you keep the Cub Scout Promise with all of your heart, you can hardly help it... people are going to like you. You're going to have favor with man, with other people. And because you are serving God with all of your heart, you will have favor with Him, too. What are some good things about having favor with God and man? Well, Psalms tells us that God's favor is like a shield, protecting us (Psalm 5:12). And I found an amazing example of some people who had favor with man in Exodus chapter 3. I'll tell this one story, and then we'll be done. So, the Children of Israel were in slavery in Egypt. A man named Moses was asking the king of Egypt, who was called the Pharaoh, to let them leave, but Pharaoh wasn't listening. Finally Pharaoh let them leave, but God told the children of Israel to ask the Egyptians for gifts. Clothes, jewelry, that sort of stuff. Can you believe that? Slaves being released, and asking their own old masters to give them presents! And guess what? The Israelites asked, and the Egyptians gave it to them! Now that's favor with man! "Jesus increased in wisdom and in stature and in favor with God and man." Growing up is hard sometimes, and things like taking correction and being faithful are tough. But Jesus had to do it, just like you and I do. He knows what it's like to be six years old, or seven, or eight or nine or ten or eleven or however old you are. And when you're having trouble, you can always pray and turn to Him for help. Jesus grew up, once upon a time, and He can help you as you grow up too!